Several businesses start with minimal resources, as many set up their offices in a living room, garages and basements. As startups are burgeoning, expanding to new office space is forthcoming. When we look into the process of selecting office space in Bangalore, location is considered as a secondary factor by many business owners. Rather, the cost is at the top of the list, along with the size. Once you are out looking to rent a workplace, the planning should start well in advance in order to find the place that might be suitable for the space you are looking for. This task must be completed without any rush or pressure before signing the rental agreement. You can save enough time for space you are looking isn’t in your affinity, this will give you time to search for better options. Work with a trusted estate agent. The very first you sign for either leasing or renting an office space should be alongside a trusted professional who is ready to work on your behalf. A professional real estate agent can explain to you every single detail mentioned in the agreement. A genuine understanding about the office can save you a lot in the long run of your business. If your business is running from home, you might be holding your meetings with clients in your living room, which for many is not professionalism. As a startup, your budgets can be tight, and if you’re planning on hosting regular lunches, you will be draining all your resources. There are plenty of virtual office spaces in Bangalore that offer you a place to meet clients, in addition to this they also provide you with a professional email address. At present, every business needs access to the internet. Phone coverage has become a must to all the startups and many of those are primarily using smartphones for communication. However, office spaces in cities have limited or even no connectivity because of the nearby infrastructures. Prior to signing up for a new office, check around the office reception, whether there’s connectivity or not. Reach out to the internet providers to ensure that they provide internet service to the address of your workplace. Find all about the space that you are renting. For instance, check to that the landlord has issued the rate as per the actual footage and if space is actually available to work in. This makes it necessary for you to visit the place and make sure the landlord shows you everything that he/she had promised you. While you are renting a workplace, start with smaller offices in the buildings; the landlord might just offer incentives on larger spaces once you are in the property. See to that the office space provides you and your employees the right kind of environment to work. Many entrepreneurs often neglect the ambience but considering it can have a massive effect on image, reputation and the productivity at the workplace. Quiete workplaces are not just important for your employees, but a lot depends on the reputation when you look to meet clients, partners or investors. Perhaps the best thing to consider is to check out whether the ambience is perfect to work; the ambience is necessary before signing the agreement. Also read: Office Spaces: Should You Buy or Rent one? At some point in time, any building might run into some repairs. It is essential while you rent or lease office space, to check who’ll be paying for the repairs. The repairs may be hidden costs that aren’t represented in the rent you pay. In case, you are responsible for repairs; it might have a massive impact on your monthly expenses in renting of a space. 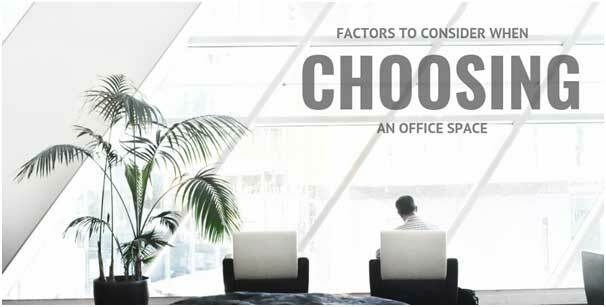 Choosing a right office space considers a lot. The factors that we’ve mentioned above can help you select a great office space where your business can start to bloom again. If you are in search of an office like this, you might as well consider taking opinion from a specialist in this field. If you are unable to find an expert, you can surf the net which will give proper knowledge about the facts.